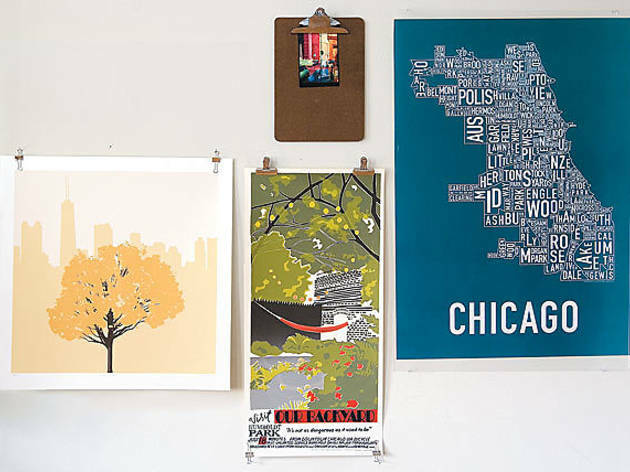 Don't get hung up on frames for your prints; try these attractive alternatives instead. The problem many affordable-art enthusiasts encounter is that when it comes to displaying the work on a wall, collecting suddenly becomes a costly habit. Even loading up on cheap IKEA frames can add up. Our solution? Simply skip the frame. A little ingenuity—and a stop at your local office-supply store—go a long way. Inspiration We first saw this industrial-chic clip technique used at a Columbia College gallery display of Bird Machine posters. How to Make a pencil mark on the wall at each corner of the poster, so you know where to hammer the nails. Nail through the center of four bulldog clips (one at every corner) and hang the poster (buck naked or mounted on matte board) against the wall. If you want to create a sense of depth, wrap one end of clear fishing wire around a nail and loop the other end through the hole in the bulldog clip so the poster hangs freely a few inches from the wall. (If your poster rolls up, add weights to the bottom of the paper.) Vary the lengths of the fishing wire with a group of prints for visual variety. Inspiration Being a magazine fiend sometimes pays off. We were inspired by photographs of the studio of Scandinavian artist Lotta Jansdotter in out-of-print mag Blueprint (it’s still online, though: blogs1.marthastewart.com/blueprint), which showed the artist using about a dozen clipboards on her wall to organize her ideas. How to Simply nail through the center of the clipboards onto the wall, then post a few of your favorite postcards and small prints on each board. Inspiration The combination of scant funds and scores of work forces art students to get creative with their showcasing techniques. As a result, the frame-free Plexiglas approach has popped up at university galleries around town. 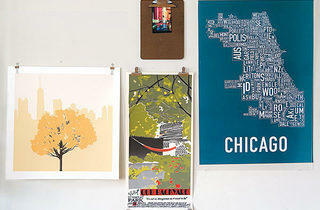 How to Blick Art Materials (42 S State St, 312-920-0300) has everything you need for this DIY framing job. Slide your print between a piece of foam board ($2–$4) and precut Plexiglas ($2–$20). Adhere the unit to the wall using either L-shaped nails ($10 for a box of 100) or Frameless Swiss Corner Clips (starting at $10), which, unlike the basic nail and hammer method, securely bind the foam and Plexiglas together with clips before you hang the piece on the wall.